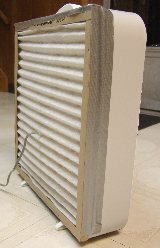 A DIY home air purifier for those who cannot afford to immediately get one of the more expensive models. Simply get a box fan and place a Filtrete filter (1200 or better) on the intake air side of the fan. You can tape the filter to the fan or when the fan is on it will stay in place with just the pull of the airflow. What a nifty idea!! Going to try this for sure!